Northampton TIGERS – it’s a wrap! The interprofessional team on set. As part of TIGER (Transforming Interprofessional Groups Through Educational Resources) Paramedic science and midwifery health professionals at the University of Northampton have joined forces with the police in the School of Social Science and academics and students from the School of the Arts to develop a new interprofessional learning resource. Initially academics from health and social science met and agreed it would be really helpful to develop some interprofessional learning resources that focussed on situations where these three professionals found themselves working together. Interprofessional education has been an important part of health education at the university for ten years with a growing number of professions becoming involved. There has been much discussion about the police being involved in some interprofessional learning with recognition that new resources would have to be developed to effectively meet the needs of specific groups of students. At the CAIPE (Centre for advancement of Interprofessional Education) corporate forum, held at Leicester University in March 2011, the plans for this work were presented and there is some interest in this resource from the interprofessional education community. Over some months a scenario was developed based on a real case of domestic violence involving a young pregnant woman with some amendments to ensure anonymity and to highlight interprofessional learning opportunities. Initial thoughts were that students could role play, this was discarded as we felt students would focus on the role rather than interprofessional learning. We then thought actors could role play with students observing and then facilitated discussion however it was felt this would be difficult to replicate and may difficult to organise as a regular event. It was agreed to ask acting students to play the role and we would film this giving us a resource that we could reuse with different groups of students with relative ease. This was where it really got interesting as the performing arts tutor began to work with us and the students, auditions were held on 13th May, the actors cast and filming set for 20th May. 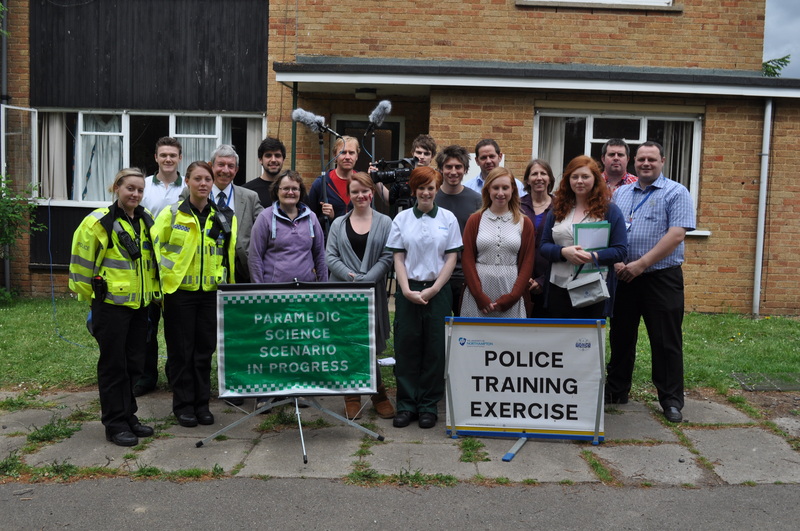 On 20th May, acting, paramedic, police and midwifery professionals were at the ‘scene of crime’ house used for police training in Northampton with 2 police students and 8 acting students. We (health) had turned up with our Flip cameras thinking we would just point and film and be finished by lunchtime – not to be the case! Within an hour one of the Arts tutors had borrowed some equipment to make a broadcast quality film. We spent the whole day drawing storyboards, rehearsing and filming with the acting tutors directing the filming, with students operating the film equipment. Students put great effort into their acting roles with health and police professionals offering advice and guidance on the authenticity of their professional representation. Why have I blogged this? Everyone involved enjoyed and benefitted from this experience and while our original aim was to develop resources for interprofessional learning what happened was that as a team we demonstrated effective interprofessional working and learning. There was great sharing of skills and expertise, definite learning with, from and about each other and the outcome benefitted from this. I learned about filming, the limitations of Flip, the benefits of having the right equipment and also importantly having someone with the knowledge and expertise required for the job. I also learned that every room has its own sound! The film is currently being edited and it will be available as an open educational resource (OER) in the TIGER repository later this summer. Last Wednesday (18 May), Professor Ian Hargreaves of Cardiff University published his review, commissioned by Prime Minister Cameron, of copyright law in the digital age. The Hargreaves Report, by comment consent, recommended some much-needed changes but falls short of the ‘radical overhaul’ of copyright law demanded by many. Similar to the way the 2010 Digital Economy Act was concerned largely with targeting illegal digital downloads, the focus of the report is on protecting the intellectual property of the copyright holder (the traditional approach) rather than offering ways that incorporate the idea of fair use, which would require new, innovative models. Fair use is where significant portions of a work can be replicated without permission as long as the work or reputation of the copyright holder is not denigrated. For example, I would’ve liked to have used a snippet from a Beatles song called I’ll Follow the Sun for – not surprisingly – our recent e-learning conference. The snippet is available on Wikipedia. When you further investigate the licensing, you’ll find that it’s been uploaded because it qualifies under the US fair use laws. But we don’t have a similar law in the UK, so I didn’t use the song, although clearly my intent was not malicious. The Hargreaves Report looks set to ensure this continues. Having flexible, fair and transparent copyright laws in the UK is vital if open educational resources are to become as mainstream here as many would like. These laws have to include fair use. President Obama’s announcement in January of a $2 billion fund is an acknowledgement of how central OERs are likely to become in education. This week, Net pioneers led by Mark Zuckerberg and Eric Schmidt have been lobbying the G8 summit in Paris against increasing attempts to regulate the Internet and especially the Web. Central to this has been the thorny issue of intellectual property. But when it comes to copyright law, the traditional approach consistently trumps any innovative model. At least in the UK and EU, which is in the process of updating its intellectual property laws in a way that may make even the modest loosening up recommended by Hargreaves difficult to enact, that doesn’t seem likely to change in the near future. It’s been roughly six months since our very successful (even if I do say so myself!) Learning Futures Festival. Since then, as part of our OTTER project, I’ve been busy beavering (ottering?) away on converting the presentations into OERs (open educational resources). It’s been great to learn how to edit video, however basic, and I’m still on a quest to find the perfect open source cross-platform software. With copyright cleared and the video edited and uploaded we been able to release over 35 out of approximately 50 keynotes, workshops, presentations and daily addresses. That’s a staggering 70% of all presentations out of our festival which are available for you to download and listen to again. This is just one way we are helping to contribute to an open future. In addition, publicly releasing these presentations helps make the Learning Futures Festival 2010 a year long event, continually impacting and benefiting new people every day. As some of you may be aware, the OTTER project has now come to an end here at BDRA. I thought I will share with you some of the things I learnt as OER Evaluator on the project, screening and transforming materials received from academic staff and turning them into OERs. It was found that, because materials submitted by academic staff were originally developed for a face to face learning environment, content was included which was linked to Blackboard, the VLE used here at the University of Leicester. Understandably we also found that materials submitted were intended for specific target audience e.g. Masters level studies. A related finding was that the materials were more oriented towards formal as opposed to informal learners. The other thing which emerged from screening the over 360 credits worth of teaching materials is that they were, pedagogically speaking, instructionally oriented. We also found, on some occasion, images without appropriate reference and a broken links embedded into the material. I don’t think these findings are exclusive to OTTER and I suspect other projects in the JISC/HEA institutional programme on OERs found similar evidence. What these issues call for are evaluation tools not just for developing OERs but ones that support the transforming of existing teaching materials into OERs. In OTTER we spent a significant amount of time addressing these issues to ensure that the final product released was of high quality and reusable. An outcome of these efforts was the CORRE framework. For long-term sustainability gather evidence of the impact of the OERs through tracking of their use and repurpose. I recently had a useful discussion with colleagues at Beyond Distance about how curriculum, Intellectual Property Rights (IPRs) and Open Educational Resources (OERs) relate to each other. Let me try to summarise the main themes. First, we discussed where various OERs that we knew about (such as the ones from the OTTER project) could be placed in a 2 by 2 chart something like Fig. 1. Admittedly, we ran into some trouble in defining what we meant by the terms, but for ‘Altruistic’ we had in mind institutions that created OERs for the benefit of learners who might not otherwise be able to access such knowledge. ‘Commercial’ was plainly the label for institutions that wanted to profit financially, at least indirectly, by creating OERs. ‘Supply-driven’ stood for institutions that created OERs despite the lack of solid evidence that learners would use and benefit from them, while ‘Demand-driven’ described institutions that respond to known demand for OERs by creating them. When we discussed OTTER, it seemed to us supply-driven: the University of Leicester accepted a contract from JISC to create the OERs. Altruistically, the university will make these freely available to those who want to use them. If there is a commercial motive at all, perhaps it lies in the university’s hope that the OERs will ultimately attract more registered (paying) students. OpenLearn, at the Open University, is similar to OTTER, but demand for (downloading of) its OERs has been considerable, so is it more demand-driven? TESSA, the altruistic OER programme for teacher education in Africa, leans towards being demand-driven as the governments of the countries involved have all asked for the OERs to be available to their students, including serving teachers for upgrading. 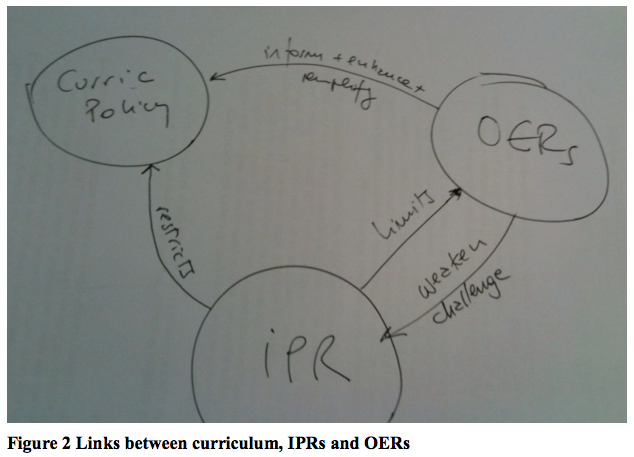 Our discussion then moved towards whether and how the curriculum can be influenced by OERs and how these two relate to academics’ intellectual property rights (IPR). Figure 2, a rough sketch, reflects some of our thoughts. It occurred to us that academics, in protecting their intellectual property rights (IPRs), probably restrict the curriculum; they also restrict the OERs that can become part of the curriculum in their university and beyond. Individual authors may have the power to include their books and articles in the curriculum, or to exclude them. Yet the creation of OERs is a process that can weaken or challenge the authors by asking them to sign a Creative Commons licence that allows learners to use the OER materials for nothing. The more we looked at the sketch, however, the more we thought that the OER could inform, enhance and amplify the curriculum – at least the policy if not the practice. Certainly that’s the intention behind the general OER movement. This is a hurried note of quite a lengthy and detailed discussion aimed at clarifying what we hope to write up this month in a paper for a journal. My thanks to Ale and Sahm.